Epic Games has plans for a brand new game property. How much do you want to bet that it's a My Little Pony platformer? Epic Games has a lot of fingers in a lot of pies, but it sounds like the studio is about to get its metaphorical digits even dirtier. The company has confirmed that it's working on a brand new, unannounced videogame property. However, aside from the project's existence, Epic is keeping mum on any other details. 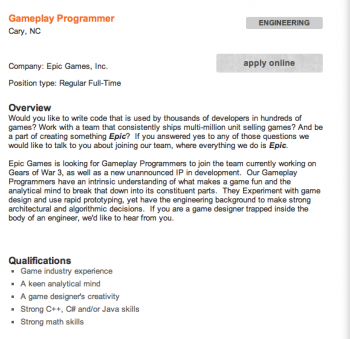 "Epic Games is looking for Gameplay Programmers to join the team currently working on Gears of War 3, as well as a new unannounced IP in development." Gears of War 3 is due out on September 20th, so it seems reasonable to assume that this new IP would be under development pretty soon (if it's not already).